The Concerto for Piano and Orchestra, Opus 10, was the first composition ever written for a two-keyboard piano, the Bechstein-Moor grand piano, named after its inventor, composer and pianist Emánuel Moór. 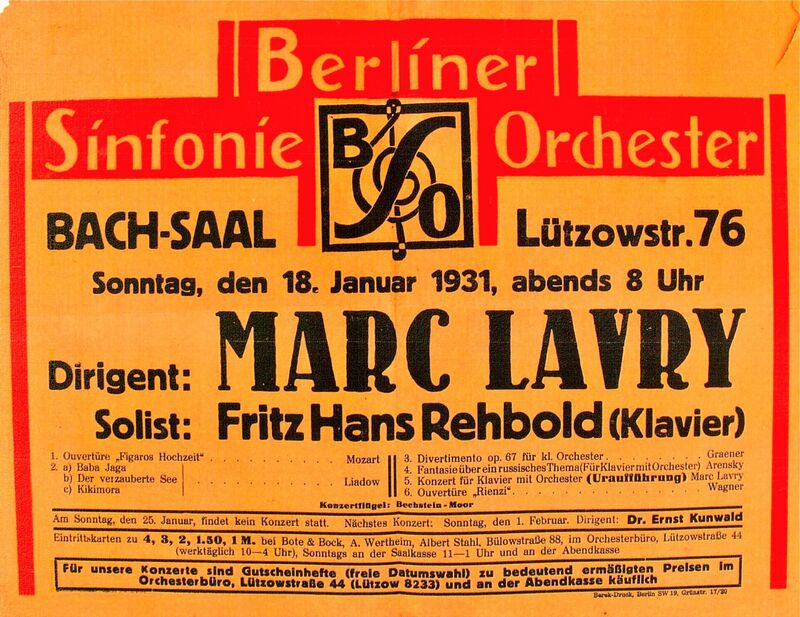 The concerto debuted on January 18, 1931 at the Berlin Symphony Orchestra (Berliner Sinfonie Orchester) concert, at the Bach Hall. 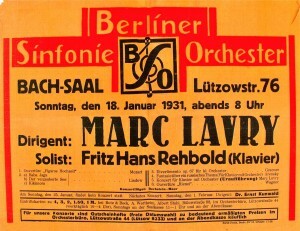 The soloist was renowned pianist Fritz Hans Rehbold and Marc Lavry was the conductor. The concert, during which the piano was introduced to the musical community, was attended by the top musicians of Berlin. The critiques praised the composer and the pianist. The concerto was later performed in Riga too. As a promotion for their new instrument Bechstein, the German manufacturer, sponsored a competition for the development of a notation method for this piano. 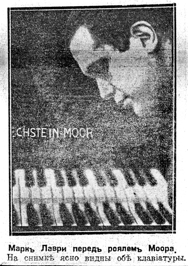 Lavry won first place and published a pianist’s guide for the Bechstein-Moor grand piano. —From the book ‘Doubly Expelled’ (Doppelt vertrieben) by Prof. Dr. Jascha Nemtsov, Chair for History of Jewish Music at the Liszt School of Music in Weimar, Germany, published in November 2013.